I've blogged about Thai green curry and Thai red curry before but both of those recipes used a store bought paste and I was really wanting to try making them without a pre made paste someday. I recently bought First Crack Your Egg, a fairly basic cookery book, but I thought it may encourage my hubby with a kitchen phobia to try some simple dishes. While looking through it I found a great recipe for thai green chicken curry and just had to try it. I had added ginger to the recipe to add a little more flavour and texture to the dish and used only 1 small lime instead of 3 large ones. It was definitely tasty and not as complicated to make as I thought but this recipe tasted a little blander than I'm used to. I'll be trying it again sometime but adapting a little more. 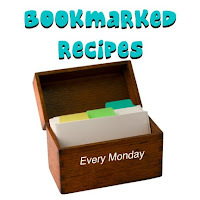 This is my entry for Bookmarked Recipes (20). 1. Chop the spring onions. Blitz the chilli, garlic and ginger together in a mini blender or crush in a mortar and pestle. 2. Heat the vegetable oil in a wok. Add the spring onion and chili, garlic & ginger paste and stir so as not to burn. Cook for 1 minute. 3. Add the chicken and cook for 4 minutes or until sealed. 4. Stir in the lime and lemongrass, making sure it is well mixed. 5. Add the fish sauce and coconut milk. Stir well and leave to simmer for 10 minutes. 6. Mix in the coriander and cook for a further 2-3 minutes before serving with jasmine rice. I love Thai Green Curry. Ive also considered ubying the book for my hubby too! PerhapsI can get him to have a go at this recipe for me! I have to live through everyone else's curry creations, because my husband isn't a curry fan. This sounds so delicious! Oh I love Thai Green Curry and yours looks so delicious! I love curry and Thai flavors! You really captured them here Ruth. Beth, you should!!!! Get that man cooking! Hey Dell... what's not to love about curry? Deborah I'm so sorry!!!! I'll bet you get curry in a restaurant anytime you can though right? Very true Rosie - though I'm a curry fan any time of year!!!! Ruth, that looks really good. I love Thai curries and green is my favorite. Thanks for the recipe. looks yummy ruth. great pic! Thanks Priscilla! I'm working on taking better photos. Oooh I love Thai green curry Ruth...& yours looks great. I think I'll give this a go soon. YUM!! Mmm I love green curry! I need to make some of this soon.